Discover some of Turkey's best historical, cultural and natural landmarks on this tour; one of the Turkey's must sees is legendary Istanbul, full of ancient monuments and intoxicating bazaars; combining striking geological marvels, such as Cappadocia is best known for its unique landscape of valleys and rock formations and the underground cave cities and the marvelous volcanic rock"fairy chimneys". And the geothermal springs and white travertine terraces, cascading mineral pools of Pamukkale once fed royal baths. 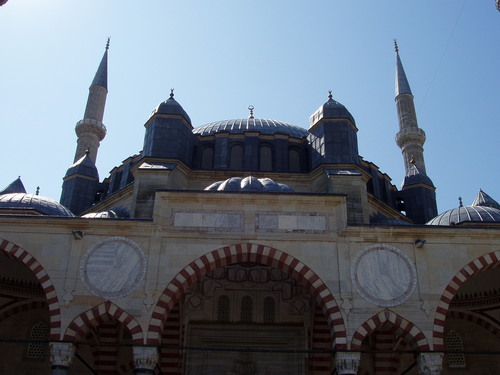 Visit Mevlana mausoleum and get immersed in Rumi's philosophical thoughts. The west coast of Turkey has much to offer even the most seasoned traveller; experience the local life of charming unspoiled Old World Mountain village called "Sirince" then visit the remarkable ancient ruins at Ephesus where the Greco Roman world comes alive and the House of the Virgin Mary, located in a nature park between Ephesus and Selcuk, is believed to the last residence of the Virgin Mary, mother of Jesus. Golden Horn shores reflect the city's colorful ethnic mosaic. With the mixtures of Armenians, Greeks, Gypsies and Turks living along Golden Horn shores reflected the city's colorful ethnic mosaic. You will be met by your guide at 08:30 am. We will drive to Chora Church which has the best late Byzantine mosaics and frescos telling you stories from Old Testament, New Testament with fantastic mosaics and frescoes portraying scenes from a bible, the life and miracles of Jesus. Being the center of the eastern Christianity, Istanbul is full of Byzantine relics which tell about this refulgent empire’e past. After listening the explanations of these mosaics and frescos you will continue to thePorphyrogenitus Palace(Tekfur Palace) ruins and the Theodocian city walls at Edirnekapi. As the only existing Byzantine palace and an example of the Byzantine architectural style, and it gives a fine idea of what the emperor's residence might have looked like in Byzantine times. Then visit the Patriarchate at Fener Patriarchate of Greek Orthodox World. 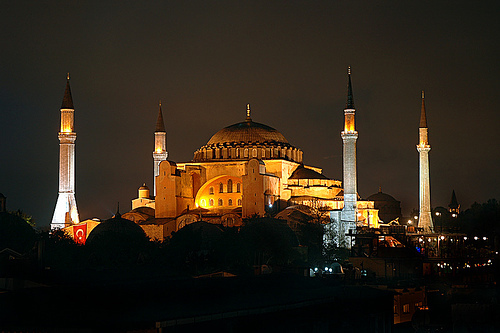 Which is the seat of Orthodox Christianity since Constantine The Great’s declaration as the religion of Roman Empire. The Valens Aqueduct (Roman Aqueduct)The surviving section is 921 metres long, about 50 metres less than the original length is a Roman aqueduct which was the major water-providing system of the Eastern Roman capital. 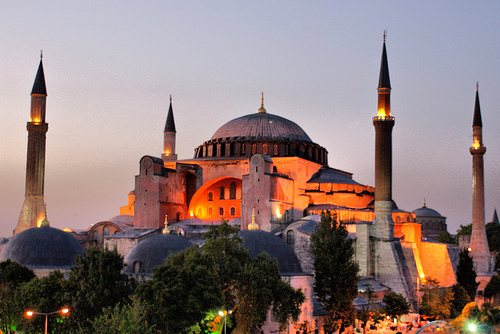 Completed by Roman Emperor Valens in the late 4th century AD, it was maintained and used by the Byzantines and later the Ottomans, and remains one of the most important landmarks of the city. Then we will visit Rustem Pasa Mosque was designed by Ottoman imperial architect Mimar Sinan famous for its large quantities of exquisite Iznik tiles, set in a very wide variety of beautiful floral and geometric designs, is among the city's architectural gems. 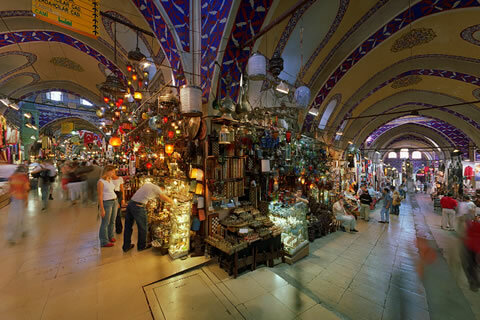 We will finish the tour by visiting the Egyptian Spice Market; vividly colored spices are displayed alongside at this Ottoman-era market place. Then drive to your hotel. Checkout from the hotel then transfer to Ataturk Airport to catch the morning flight to Cappadocia. Arrival and meeting at the airport arrival gate you will be met and transferred to Cappadocia to join the tour. Our first real encounter with Cappadocia almost Martian landscape is in the Dervent valley. We visit Pasabag's "fairy chimneys", where the voice of the wind harmonizes with songs of the fairies. From here we pause at Avanos center of terracotta art. The ceramic trade in this district and its countless pottery factories date right back to the Hittites, and the ceramic clay from the red silt of the Kızılırmak has always been used. A visit to ceramic & tile center to see how the ceramics made by hand. 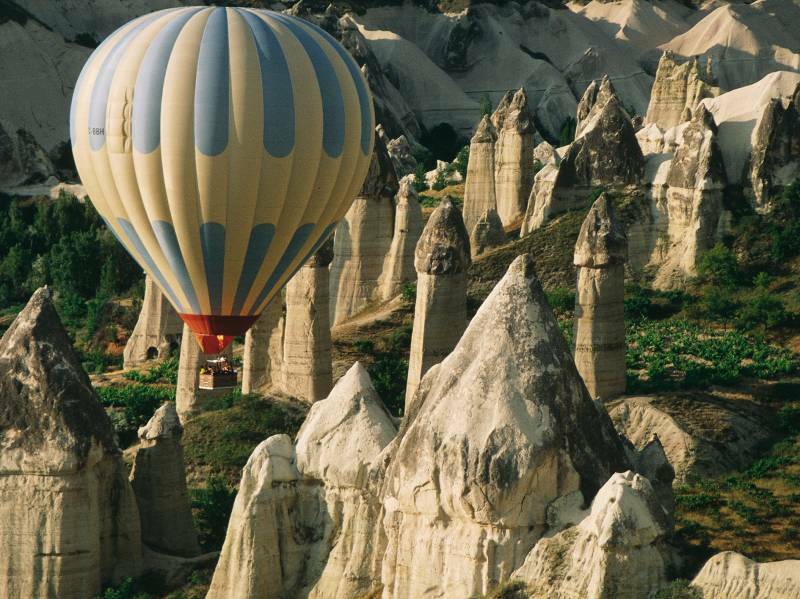 After lunch we visit the famous Goreme Open Air Museum to see the best examples of Byzantine art in Cappadocia. People of Goreme, at the heart of the Cappadocia Region, realized that these soft rocks could be easily carved out to form houses, churches, monasteries. We will enjoy the day by taking a look to the Goreme Valley from next to the Uchisar Rock-castle; has the numerous hollowed-out containers, rock tombs, and a large water cistern all welcome you as silent witnesses to history and human life giving you a panoramic view of the valleys of Cappadocia. End of the tour you will be transferred to your hotel. Enjoy your cave hotel. Pick up from the hotel will be early in the morning around 06:30am. Departing from Cappadocia to Pamukkale through Konya it is going to be over 3 hours driving to Konya where you will have your lunch. Konya Tour: Visit 13th century Selcuk caravanserai (an ancient hotel for the caravans)"Sultanhan" in Konya then you will continue to Konya. Here you will first visit the museum of Whirling Dervishes and the Mevlana Mausoleum the great mystic poet and Islamic spiritual leader, who founded the sect of ''Whirling Dervishes''and have lunch. After exploring the city little bit more you will continue to Pamukkale and overnight stay. Drive to the hotel in Pamukkale. Pick up from the hotel early in the morning and 20min. 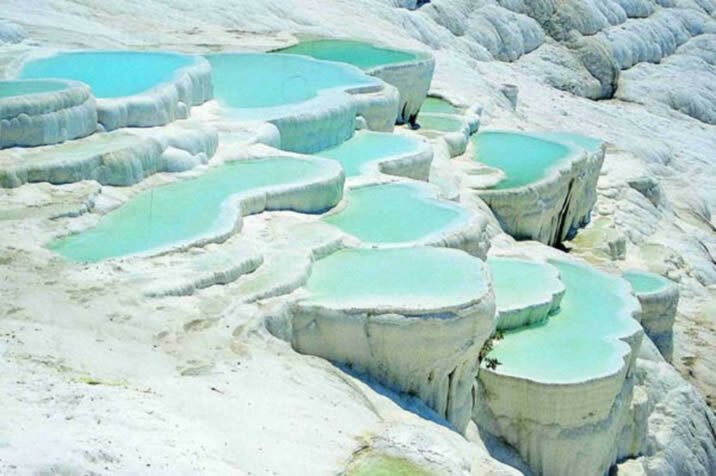 drive to Pamukkale that has the meaning of the Cotton Castle in English. Once known as Hierapolis, famous for healing thermal / mineral Baths and beautifully snow-white “petrified waterfalls". After C/out and breakfast we will drive to the ruins of Hierapolis antique city and the travertine terraces and hot springs at Pamukkale. Drive to Aphrodisias hrough the Aphrodisias Ancient site, one of the most beautiful classical sites in Turkey which was built near a marble quarry that was extensively exploited in the Hellenistic and Roman periods, and sculpture in marble from Aphrodisias became famous in the Roman world. Upon arrival to Aphrodisias first lunch break (estimated between 13:30pm-14:30pm)the visit the Temple of Aphrodite and the most complete stadium to have survived from the ancient world. Continue to pretty coastal town of Kusadasi for overnight stay. Optional: You may choose to swim in the Pamukkale Antique Pools (Cleopatra’s pool) (at own expense) during the 1-1,5hours free time. Driving Distance (Kusadasi to Sirince): Apprix.30min. You will directly visit to Sirince village which was founded by the Greeks living around Ephesus before. Today the locals of this village are Turks and the village is famous for Turkish Pancake and fruit wine. This delightful village, 12 km away from Ephesus and 30 km from Kusadasi, was once Cirkince ("ugly").There is a story that the village was settled by freed Greek slaves who named the village Cirkince (meaning "Ugly" in Turkish) to deter others from following them. Indeed its habitants gave this name on purpose as they did not want to be bothered by foreigners or to share the beauty of their village. 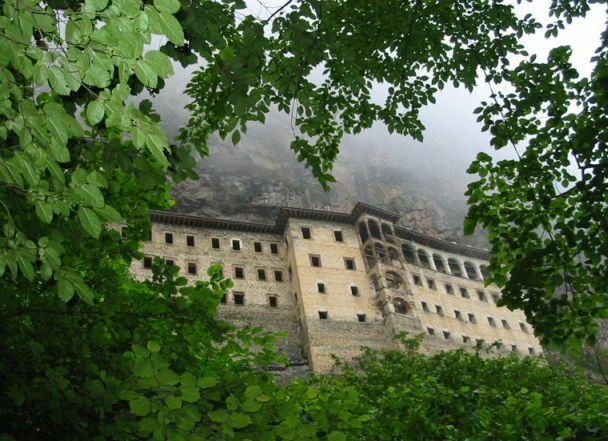 Still after years, visitors understood that the village was not ugly at all and called it Sirince ("pretty"). As the village is located on the top of a mountain, anyone will enjoy the impressive wine yards' and peach trees' views on his way. This lovely village is famous for its own wines and olive oils and garden produce. 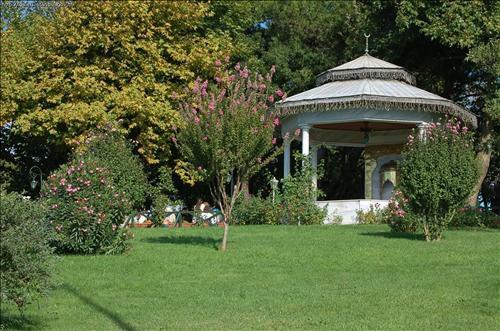 Sirince especially worth visiting for the magnificent scenery, in particular the breathtaking views of olive groves and lush countryside en-route to the village. After the half day tour here before heading to Kusadasi there will be one hour lunch break in this nice village. Drive to your hotel then free at leisure at this nice resort and overnight stay in Kusadasi. 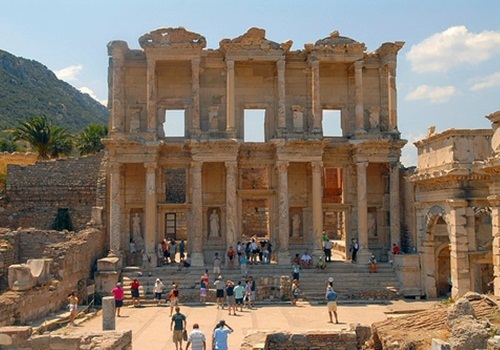 Explore the amazing ruins of Ephesus. After breakfast C/out from the hotel; tour starts from Kusadasi proceed to the House of the Virgin Mary includes scenic views of the Byzantine fortress in Selcuk and the Temple of Artemis. A long winding road affords wonderful views of the valley en route to the Shrine of St. Mary. The diminitive house, beautifully situated in the Solmissos Mountains, is considered by the Vatican to be the final resting place of the Virgin Mary. 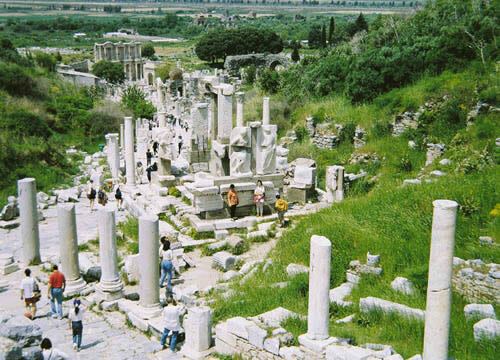 Your tour continues to ancient Ephesus, where you'll pass through the arched Magnesia Gate and begin a slow, downhill walk to the ruins of the Roman provincial capital. Your knowledgeable guide will highlight such sights as the beautifully preserved Temple of Hadrian, the magnificent Trajan Fountain, the Odeon Theater, once used for both political and entertainment purposes, and the beautiful Celsus Library with its imposing façade and two story Corinthian-style columns. The dramatic Great Theater is one of the few structures still used today. It seats twenty-five thousand and, although it was once an arena for gladiator games, it is now home to annual spring festivals. Temple Of Artemis (Diana), on the side of one of the seven wonders of ancient World. Ephesus Terrace Houses which are located on the hill, opposite the Hadrian Temple. Also called as "The Houses of Rich", give us information about family life during the Roman period. The terrace houses looked ordinary and plane outside but inside they were decorated with the highest standard of their time. Excavation of Roman artifacts continues. On request: If Suite room required - Please ask for price. On request: If Business Class Flight required - Please ask for price. On request: If Dinner on the yacht required – Please ask for price. 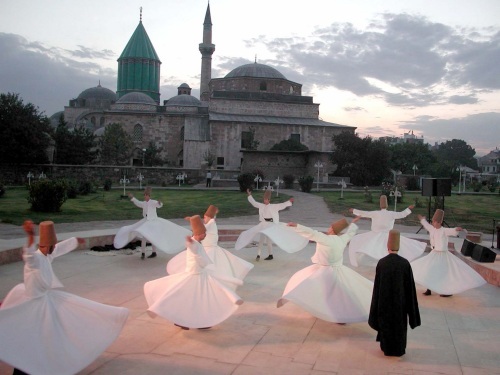 On request: If Whirling Dervish / Hodja Pasha required – Please ask for price. On request: If Turkish Bath / Hammam Package required - Please ask for price. (For the whole trip & For the whole group).